As a development class, the Moth has always attracted a small band of dedicated enthusiasts willing to put their time and effort into building their own boats. For these guys, there’s a special feeling they get when their boat starts to foil, that no production boat sailor will ever feel. In the early days, the relatively low cost and ease of construction made the boat very popular among aspiring dinghy designers. 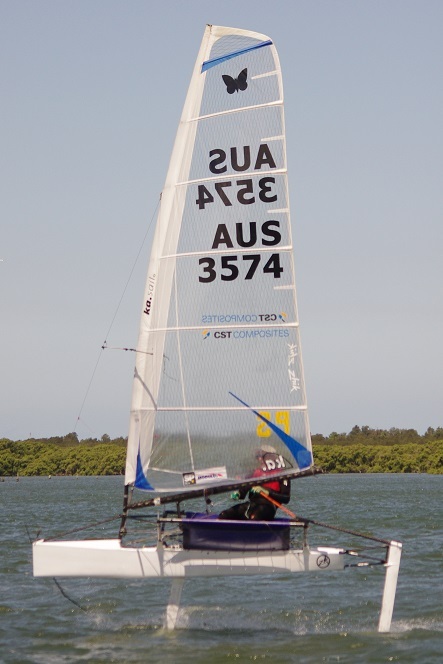 The move to carbon fibre foiling boats means that the class can no longer be considered “low cost”. However, it still attracts a small band of dedicated, enthusiastic, aspiring dinghy designers. The home build ethos in the UK was rejuvenated by Mike Cooke of Aardvark Racing. Mike has been very generous in loaning moulds, supplying parts and, most importantly, sharing his (considerable) building expertise with aspiring home builders. Phil Oligario inspiring Simon Hiscocks to build another boat! 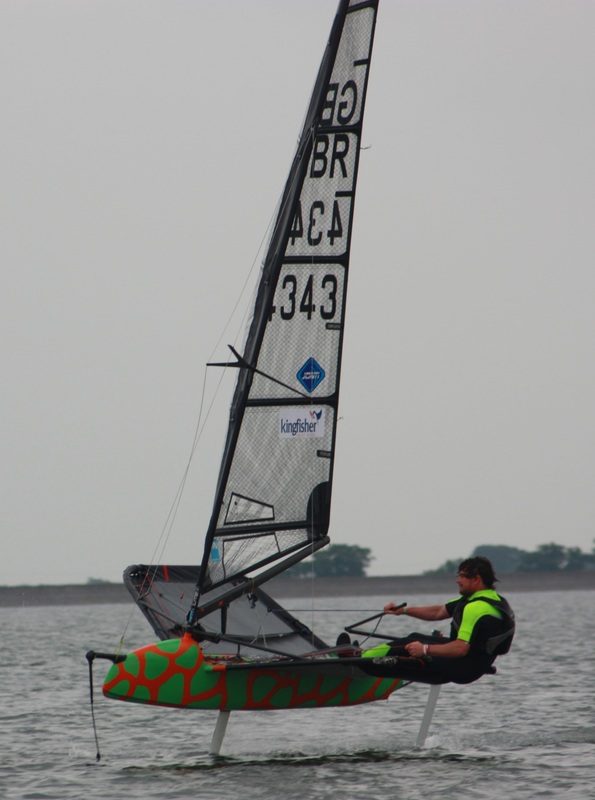 Mike Cooke supplied his Ninja moulds and coached Phil though the build of his first boat, “Ninjario”. Phil then clearly got the home build bug and decided to make his own (“Interceptor”) mould for his second boat “Gladriel” (so called, I’m told, because he fancies Cate Blanchett, not because he’s a Lord of the Rings geek). 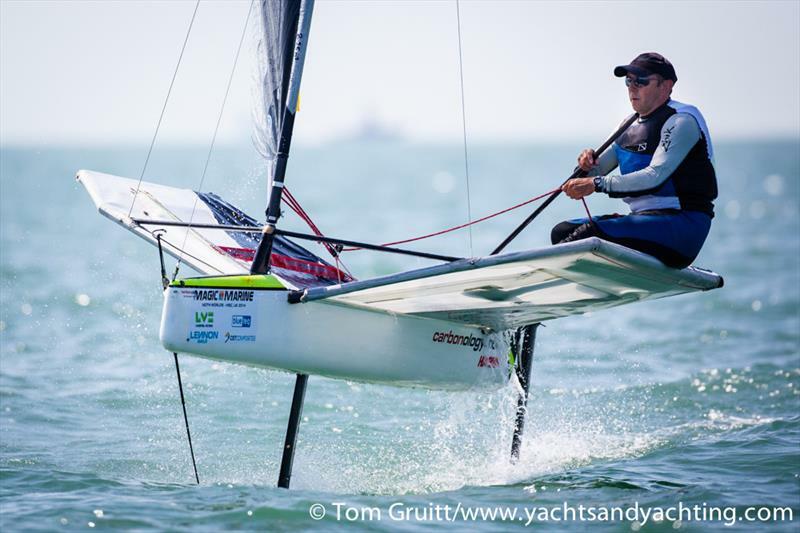 Phil also builds his own foils nowadays with the help of young Jordi Boronat. Phil’s boats use Atomik UK adjustable wands (of course). Atomik UK sponsor the Moth GP circuit with a home builder’s cup for the best placed home built boat. Richard was inspired by Adam May to design and build his own (“Spitfire”) mould. He got most of his tips from Adam and Chris Somner and worked the rest out for himself with advice from the rest of the Moth fleet. 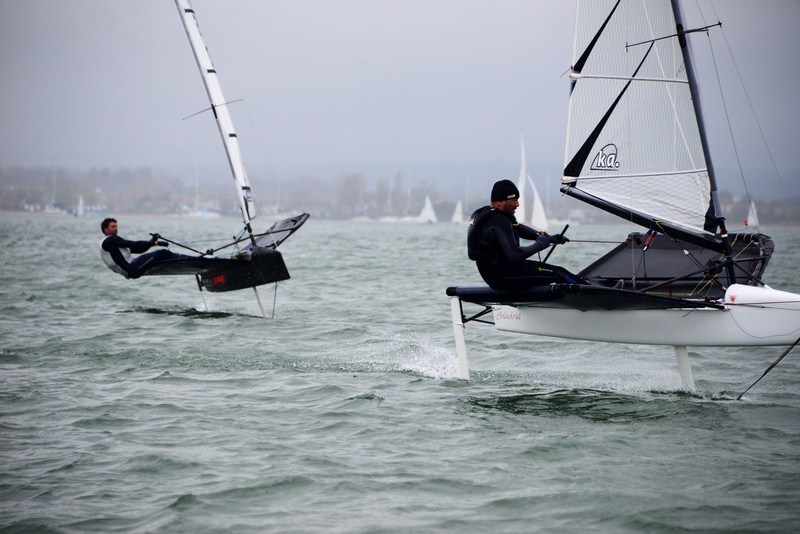 Richard’s boats use a variety of foils. PTO and Oompa Loompa use Aardvark “Ninja” foils supplied by Mike Cooke. 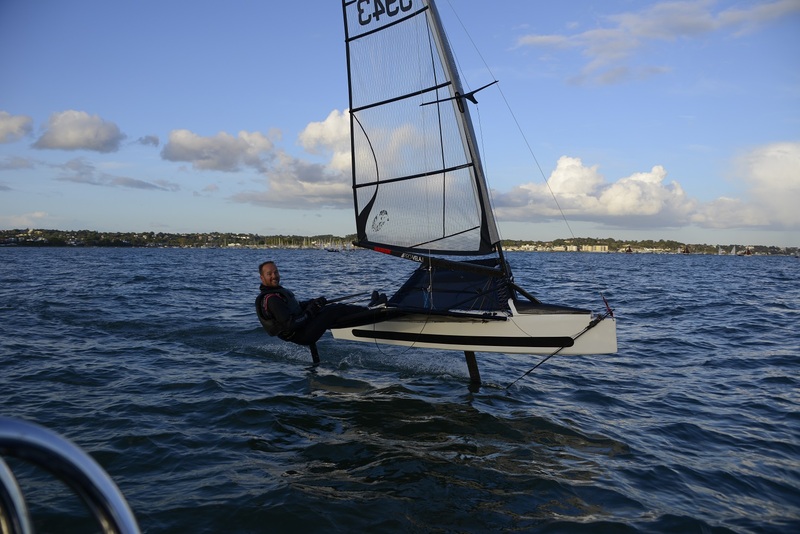 Ed’s boat uses Rod Harris’s old Prowler main foil (the foil came 2nd at 2009 Nationals in Saundersfoot so Rod tells me). 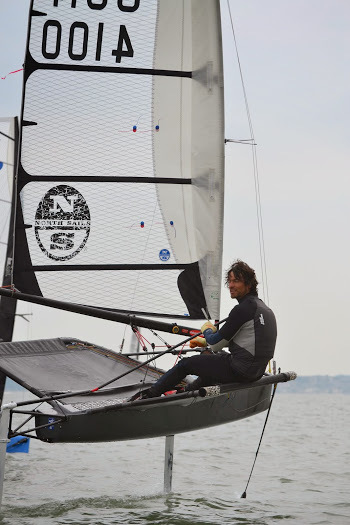 Whilst Richard’s Daisy herself used Aardvark “Ninja” foils last year, but has now been modified to take an old Maguire Exocet main foil from Tom Offer. 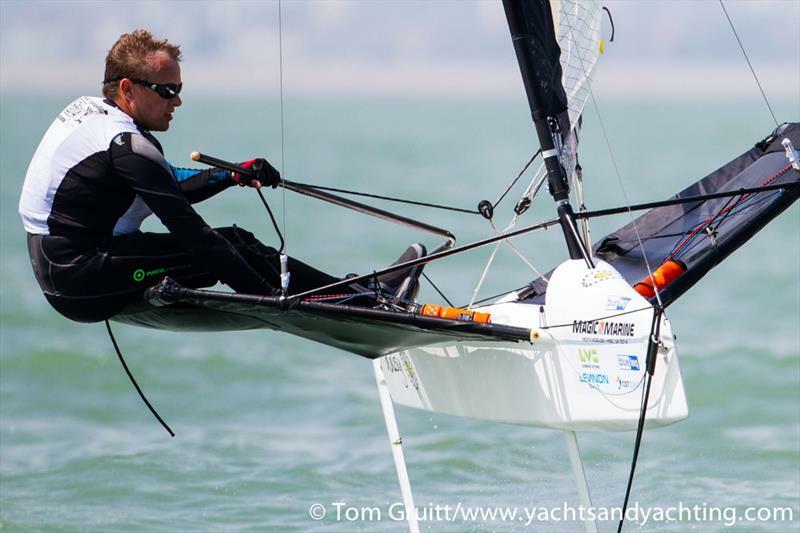 Please note that this is not the same foil that Tom left at the bottom of Poole Harbour during the 2014 Parkstone Open! Dinger had sailed junior moths for 3 or 4 years only to be diverted by work. After owning a Magnum 6 and 9 and being around Rod Harris, it seemed the natural next step. So when Richard Edwards suggested building a Moth together, he was always in! Mad Max (now PTO) was the first out of the mould with Oompa-Loompa the following year. Edd’s started to build his boat not long after Dinger’s boat left the mould, but development stalled after he foolishly diverted most of his funds into buying a house! However, Edd’s now managed to complete the boat and took her for her first sail on Good Friday 2014. Unfortunately the wind was slightly to light for her to foil on her maiden voyage, but after adding a bungee around the tiller Ed was soon able to get the hang of her as you can see. Alex completed his boat “Chopper”, in October 2013. Alex was inspired by Phil who just said “just give it a go mate!”. However, I think that Phil wishes that he hadn’t encouraged him so much when Alex proceeded to beat him at the Queen Mary open! Glen Read, a Kiwi living in Winchester, is one of the latest additions to the home build fleet. His boat was completed just in time for the UK Nationals, where he unfortunately suffered a structural failure with the rear wing bars. However, after some helpful advice from Richard, Phil and Alex he was able to go home and rebuild them in a few days with a few sheets of carbon and some epoxy. Glen returned to Hayling in time for the Worlds with a boat that has survived very well to date with, what I have to say, is a very tidy repair. “I had loads of Ideas in my head but had to rein them in due to lack of experience building boats as this was my first one. It took ten months from start to finished Lunar Sea which was from the drawing board to paper templates, plug mould and the final product. There is no CAD, Rhino, or CNC, in this boat build. All building was done in my small spare room and living room when more space was needed. If we’re going to mention Kiwi’s then I guess we should include Aussies too, in which case Phil Stephenson has to get a mention. He’s been building build boats since he was a teenager and is currently building his 42nd boat! Phil is a stalwart of the Moth class in Australia and the Aussie home build King. 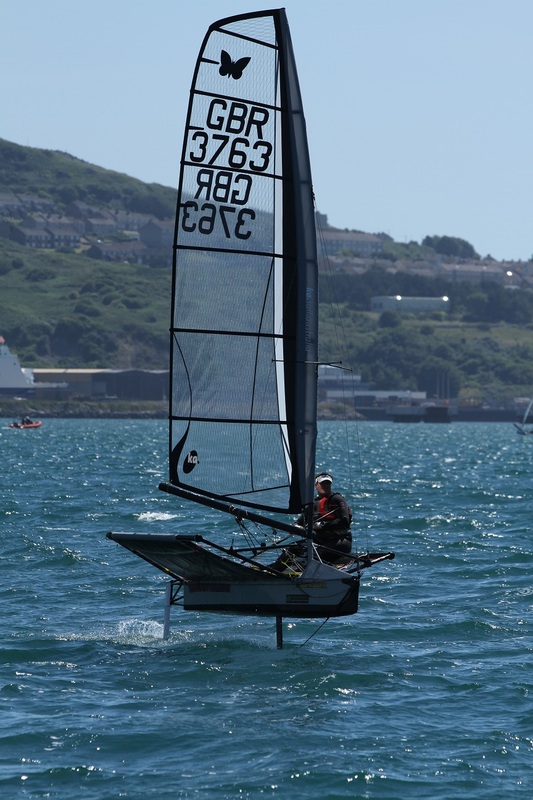 His current project is a Moth with a single piece wing mast due to be launched as soon as he gets back home from the 2014 Hayling Worlds.